Iran Politics Club Forum • View topic - Iran’s Excuse to Occupy Iraq! Iran reportedly has sent military advisers into Iraq and dispatched the head of its infamous Quds Force to help Baghdad strategize in its fight against Sunni militants, as the United States takes similar steps despite concern about Tehran's involvement. While not in lockstep, Tehran and Washington are now taking a similar approach in helping the beleaguered government in Baghdad. Fox News confirms that Iran is flying surveillance drones over Iraq, something the U.S. also is doing. The New York Times reported that Iran, in addition, is sending tons of military equipment to the fellow Shiite-led government in Iraq and is dispatching military advisers. According to the Times, about a dozen officers from Iran's Qods Force have been sent into the country. Gen. Qassim Suleimani, head of that paramilitary wing, also reportedly visited Iraq at least twice to advise the Iraqi military. This comes as the Obama administration sends up to 300 military advisers into Iraq; according to officials, 180 so far are on the ground in Baghdad. They have not left the city, and they're working on setting up a Joint Operations Center. It is unclear whether and when they might leave Baghdad to set up a similar center in the northern part of the country. The apparent involvement, however, of Iran as well as Syria is raising red flags in the Obama administration, with top officials voicing concern that their involvement could create a "flashpoint" that deepens sectarian tensions in the country. A senior U.S. official also confirmed to Fox News earlier this week that there are indications Syrian aircraft launched airstrikes against Sunni militant targets in Iraq on Monday. Asked about these developments on Wednesday, Secretary of State John Kerry warned about actions "that might exacerbate the sectarian divisions that are already at a heightened level of tension." He added: "It's very important that nothing takes place that contributes to the extremism or could act as a flashpoint with respect to the sectarian divide," Kerry said, speaking in Brussels in the middle of a multi-country tour aimed at easing the Iraq crisis. Kerry, noting reports of Iran and Syria intervention, stressed the need for a new Iraqi government, so it can make decisions without "outside forces moving to fill a vacuum." Speaking in Washington, White House Press Secretary Josh Earnest also said that the solution to the Iraq crisis does not involve militias or the "murderous Assad regime" in Syria. The involvement of Iran and Syria further complicates the Obama administration's position in trying to shore up the embattled Iraqi security forces as they face radical militants with the Islamic State of Iraq and Syria, or ISIS. In this case, Iran and Syria -- long-time foes of the U.S. -- find themselves with aligning interests in seeking to stabilize Iraq's government. However, while Iran wants to preserve Shiite control of Iraq's government, the U.S. is pressing leaders in Baghdad to create a more inclusive political system. Officials said recent strikes in Iraq appeared to be the work of Syrian President Bashar Assad's government, which is locked in a bloody civil war with opposition groups. The target of the attacks was the extremist group ISIS, which has been fighting along with the rebels opposed to Assad and has since moved swiftly across the border into Iraq. "The solution to the threat confronting Iraq is not the intervention of the Assad regime, which allowed [ISIS] to thrive in the first place," said Bernadette Meehan, a National Security Council spokeswoman. "The solution to Iraq's security challenge does not involve militias or the murderous Assad regime, but the strengthening of the Iraqi security forces to combat threats." Re: Iran’s Excuse to Occupy Iraq! BEIRUT—The threat of Sunni extremists eclipsing the power of its Shiite-dominated Arab ally presents Iran with the biggest security and strategic challenge it has faced since the U.S.-led invasion of Iraq in 2003. With the Islamic State of Iraq and al-Sham, an offshoot of al Qaeda, rapidly gaining territory, Iran deployed Revolutionary Guards units to Iraq, according to Iranian security officials. Iran has invested considerable financial, political and military resources over the past decade to ensure Iraq emerged from U.S. war as a strategic partner for the Islamic Republic and a strong Shiite-led state. The so-called Shiite crescent—stretching from Iran to Iraq, Lebanon and Syria—was forged largely as a result of this effort. Two Guards' units, dispatched from Iran's western border provinces on Wednesday, were tasked with protecting Baghdad and the holy Shiite cities of Karbala and Najaf, these security sources said. The involvement of Iran would pose yet another security challenge for the White House, and raises the prospect of the U.S. and Iran fighting on the same side. The U.S. opposes Iran's support for Syrian President Bashar al-Assad, but with Tehran is jointly supporting Iraqi Prime Minister Nouri al-Maliki. State Department officials on Thursday refused to outline what steps the Obama administration would take if Iranian forces entered Iraq. Spokeswoman Jen Psaki said American diplomats who met with Iranian officials in Geneva this week to discuss Tehran's nuclear program didn't raise the issue of the Iraqi crisis. "We've encouraged them to play a constructive role in Iraq," Ms. Psaki said about the Iranians. Iraqi Foreign Minister Hoshyar Zebari, reached by phone in London, said of the report that Iran's Revolutionary Guards were entering the fight: "Frankly I have no idea about that. I am in London now." Syria's conflict has turned Iraq into an important operational base for Iran to aid another ally, the Assad regime, which is dominated by an offshoot of Shiite Islam. Shiite militia trained by Iran, weapons and cash have flowed from Iran to Syria via Iraq. "Iraq is viewed as a vital priority in Iran's foreign policy in the region and they go to any length to protect this interest," said Roozbeh Miribrahimi, an independent Iran expert based in New York. Iran has also positioned troops on full alert along its border with Iraq and has given clearance to its air force to bomb ISIS rebel forces if they come within about 60 miles of Iran's border, according to an Iranian army general. The two IRGC battalions that moved to Iraq on Wednesday were shifted from the Iranian border provinces of Urumieh and Lorestan, the Iranian security officials said. The commander of Iran's Qods Force, Maj. Gen. Qasem Solaimani, went to Baghdad this week. Revolutionary Guards units that serve in Iran's border provinces are the most experienced fighters in guerrilla warfare because of separatist ethnic uprisings in those regions. IRGC commanders dispatched to Syria also often come from those provinces as well. Iran was also considering the transfer to Iraq of Shiite volunteer troops in Syria, if the initial deployments fail to turn the tide of battle in favor of Mr. Maliki's government, the Iranian security officials said. At stake for Iran in Iraq's current tumult isn't only the survival of a Shiite political ally in Baghdad, but the safety of Karbala and Najaf, which along with Mecca and Medina are sacred to Shiites world-wide. "The more insecure and isolated Maliki becomes, the more he will need Iran. The growth of ISIS presents a serious threat to Iran. So it would not be surprising to see the Guards become more involved in Iraq," said Alireza Nader, a senior policy analyst at the Rand Corp.
A spokesman for the militant group ISIS, Abu Mohamad al-Adnani, urged the group's Sunni fighters to march toward the "filth-ridden" Karbala and "the city of polytheism" Najaf, where they would "settle their differences" with Iraq's Shiite Prime Minister Nouri al-Maliki. That coarsely worded threat further vindicated Iran's view that the fight unfolding in Iraq is an existential sectarian battle between the two rival sects of Islam-Sunni and Shiite—and by default a proxy battle between their patrons Saudi Arabia and Iran. "Until now we haven't received any requests for help from Iraq. Iraq's army is certainly capable in handling this," Iran's Foreign Ministry spokeswoman Marzieh Afgham said Wednesday. Iranian President Hasan Rouhani cut short a religious celebration on Thursday and said he had to attend an emergency meeting of the country's National Security Council about events in Iraq. "We, as the Islamic Republic of Iran, won't tolerate this violence and terrorism…. We will fight and battle violence and extremism and terrorism in the region and the world," he said in a speech. ISIS's rapid territorial gains in the past few days appeared to have caught Iranian officials by surprise and opened a debate within the regime over whether Iran should publicly enter the battle. Iran's chief of police, Esmail Ahmadi-Moghaddam said the National Security Council would consider intervening in Iraq to "protect Shiite shrines and cities," according to Iranian media. In the short-term, analysts said the outcome of the crisis in Iraq will only strengthen and increase the influence of Iran and the Revolutionary Guards. 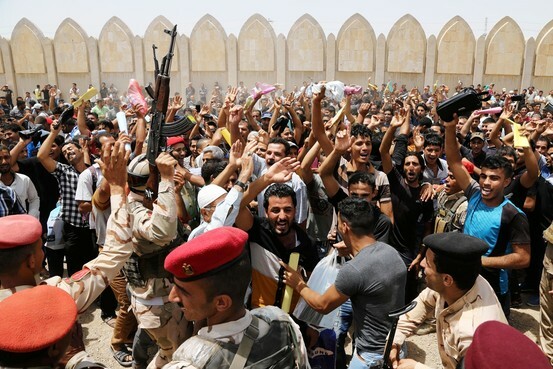 The Iraqi official said 1,500 basiji forces had crossed the border into the town of Khanaqin, in Diyala province, in central Iraq on Friday, while another 500 had entered the Badra Jassan area in Wasat province overnight. 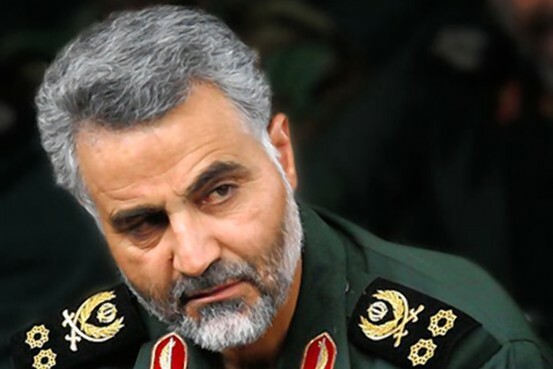 The Guardian confirmed on Friday that Major General Qassem Suleimani, the head of the Iranian Revolutionary Guards' elite Qods Force, had arrived in Baghdad to oversee the defence of the capital. Excuse me but Iran doesn't need an excuse to occupy Iraq because Iraq is already belonging to Iran. The largest part of Iraq is Shiite and it belongs to Iran. Iranian Pasdars, spies, agents and Qods are all over it. For helping with battle against ISIS, Iranians are also in Iraqi Kurdistan infiltrating there. What’s left is the Sunni part and that’s the future plan. Thank you USA to free Iraq from Saddam and now IRI is taking over!